The Mnemonic Representation of Machine Code. Assembly Language remains in use because of its close relationship to the underlying machine. It is used by those who need to compress programs into the smallest memory space and have it excecute as fast and efficiently as possible. It can be a difficult medium in which to work. Many can forget that whether done by man or compiler, all computer languages must be translated into machine code before they can run in hardware. Most high-level languages for the AVR core accomplish this by translating programs into Assembler Instructions first. The resultant Assembler Program is then converted to machine-code instructions. The process may be automated and appear transparent to the programmer. This is how the C compilers work. Since assembly language statements have a one-to-one correspondence with binary instructions it seems only logical to simply translate assembly instructions directly into binary machine code, one-at-a-time. This method does not work due to forward references and jumps to lables that have not been defined yet. This is the reason most assemblers are the two-pass type. The primary function of pass-one is to build up a symbol table that contain all the constants and labels along with their values. The second-pass then uses this symbol table to create the binary machine code. 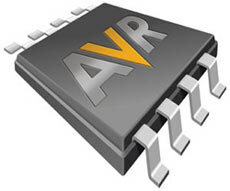 The AVR is a family of RISC microcontrollers from Atmel. The AVR architecture, first conceived by two electronic engineering students at the Norwegian Institute of Technology (NTH), has been refined and developed by Atmel Norway, in a division founded by the chip's architects. The AVR architects, Vergard Wollan and Alf-Egil Bogen. Bogen's 1992 NTH thesis was titled: High Speed Analog to Digital Converters in CMOS.